As reported by The Red&Black, the Bulldawg Box program had already registered 115 students as of August 27. The program gives students reusable to-go boxes made of 30% recycled material. The university is also keeping track of how frequently the boxes are being used, and initial reports suggest the to-go boxes are being checked out by an average of 15 students each day. In addition to cutting back on food and disposables waste, the program is also hoping to provide students that have difficulty making it to a dining hall due to busy class schedules an alternative to getting a solid meal. The Bulldawg Box program offers two distinct options: existing meal and next meal period. In the existing meal period, students have 15 minutes to fill their container and leave. The next meal period option, however, enables students unlimited time to eat a meal in the dining hall and then fill a container before leaving. To receive a box, students first inform the dining hall cashier that they wish to use a Bulldawg Box. 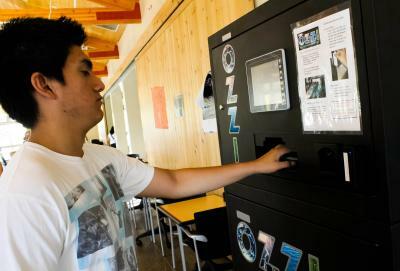 Then, using the university’s iris cameras, students verify themselves so that their accounts can be charged accordingly. Students must have a meal plan to participate, but there is no buy-in fee for the to-go boxes. However, lost or damaged boxes do result in a $5 replacement fee. As for the items student can load their to-go boxes with, certain bottles, jars or containers may be prohibited, but diners are otherwise free to take any food as long as the box will close. The program was first introduced in a pilot phase during the 2018 spring semester. A volunteer group of 98 students were asked to attend an orientation session and take a minimum of three to-go box meals per week to test the viability of the program. Additional University of Georgia dining halls may be integrated over time depending on student usage and demand.